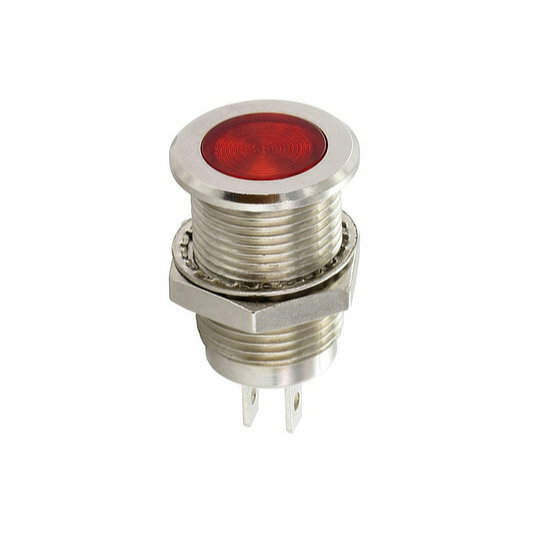 The 974/978 series of flat LED indicators from Sloan are front panel mounted indicators with threaded housing that is designed for panel cut outs of 14mm. Available with flush, high or domed lenses in a choice of clear, white, green, red, amber or blue colours and a choice of 2-3V LED in the following colours and brightnesses…. The 974/978 series are electrically rated at 20mA in a choice of 5V, 12V, 24V or 28V circuits with 2.8 x 0.5 FASTON connectors or pre-wired terminations and sealed to IP64 or IP68 depending on model. Constructed in either nickel-plated brass or blackened brass giving designers the choice of bright nickel or black casings with a variety of options in both colour and lens style.